In order for a familiar plant such as sage to garner medical clout, it must have compelling scientific evidence in its corner. More specifically, rigorously designed clinical studies involving human subjects need to be available for review in prestigious medical journals. That’s the language that speaks to many conventional physicians. It’s the proof they require in order to open their minds to natural remedies. Any idea about sage’s long-term effect on the gut’s microflora? Seems like it would be anti-microbial. But while you’re pondering that, I think I’ll add a couple of sage capsules to my daily regimen! I can’t say for certain. I’m unaware of any direct evidence on this subject matter. The closest I could find, an abstract, offers some hope: it explains that select antimicrobial foods, such as garlic, may be selectively antagonistic to pathogenic bacteria. Laura, I think you bring up a great point. I say start with the sage and if there end up being long-term effects, back off them. For now, it will be a big help! Plant sterols are generally known to help with cholesterol – although I would probably recommend consuming more plants and less meat and dairy as a more reliable method of controlling cholesterol. Complement Ther Med. 2013 Oct;21(5):441-6. Improved glycemic control and lipid profile in hyperlipidemic type 2 diabetic patients consuming Salvia officinalis L. leaf extract: a randomized placebo. Controlled clinical trial. OBJECTIVES: Evaluation of the efficacy and safety of Salvia officinalis L. (S. officinalis) leaf extract in the treatment of hyperlipidemic type 2 diabetic patients. DESIGN: Randomized placebo-controlled parallel group study. SETTING: Diabetes Clinic (Karaj City, Alborz Province of Iran). INTERVENTIONS: The efficacy and safety of taking S. officinalis leaf extract (one 500 mg capsule t.i.d. for 3 months) in treatment of 40 hyperlipidemic (hypercholesterolemic and/or hypertriglyceridemic) type 2 diabetic patients were evaluated and compared with the placebo group (n=40). MAIN OUTCOME MEASURES: Fasting blood levels of glucose, glycosylated hemoglobin (HbA1c), total cholesterol, triglyceride, LDL-C (low density lipoprotein cholesterol), HDL-C (high density lipoprotein cholesterol), SGOT (serum glutamic-oxaloacetic transaminase), SGPT (serum glutamic-pyruvic transaminase) and creatinine. RESULTS: The extract lowered fasting glucose, HbA1c, total cholesterol, triglyceride and LDL-C but increased HDL-C compared to baseline at endpoint. Percent difference mean (95% confidence interval) between the extract and placebo groups in terms of effects on fasting glucose, HbA1c, total cholesterol, triglyceride, LDL-C and HDL-C at endpoint were 32.2 (26.5, 37.9), 22.7 (16.8, 28.6), 16.9 (9.7, 24.1), 56.4 (36.1, 76.7), 35.6 (29.9, 41.3) and 27.6 (15.8, 39.4) (P=0.001, P=0.01, P=0.01, P=0.009, P0.05). No adverse effects were reported. CONCLUSIONS: S. officinalis leaves may be safe and have anti-hyperglycemic and lipid profile improving effects in hyperlipidemic type 2 diabetic patients. J Renal Inj Prev. 2013 Jun 1;2(2):51-4. Effect of Salvia officinalis on diabetic patients. INTRODUCTION: Herbs are rich sources of natural antioxidants, and are used in traditional medicine for the control and treatment of many diseases. The reducing effect of a large number of these plants on blood glucose has been approved in animal models and clinical studies. OBJECTIVES: This study was therefore, performed to investigate the hypoglycemic effect of Salvia officinalis on blood glucose, Glycosylated hemoglobin (HbA1c), lipid profile, liver and kidney function tests. PATIENTS AND METHODS: A double-blind clinical trial was carried out on 80 type II diabetic patients who had not reached the ideal control of the disease. Patients were randomly divided into two equal groups of case and control. The case group received Salvia officinalis and the control group received placebo tablets three times a day for three months. The fasting blood sugar (FBS) and 2 hours postprandial (2hpp) glucose were checked at the beginning and every 2 weeks, for three months Glycosylated hemoglobin (HbA1c), lipid profile, liver and kidney function tests were also measured at the beginning and at the end of trial and compared in two mentioned groups. RESULTS: The 2hpp blood sugar and cholesterol levels were significantly decreased in Salvia officinalis treated patients compared to control group (p<0.05). There were no significant changes in glycosylated hemoglobin and FBS between the two groups. CONCLUSION: Results showed that Salvia officinalis might be beneficial in diabetic patients to reduce 2hpp and cholesterol. However higher doses might be needed to decrease fasting blood glucose and glycosylated hemoglobin. Iran J Microbiol. 2015 Jun;7(3):173-7. The antibacterial effect of sage extract (Salvia officinalis) mouthwash against Streptococcus mutans in dental plaque: a randomized clinical trial. BACKGROUND AND OBJECTIVE: The aim of the study was to evaluate the clinical effects of a mouthwash containing Sage (Salvia officinalis) extracts on Streptococcus mutans (SM) causing dental plaque in school-aged children. MATERIAL AND METHODS: A double blind clinical trial study was conducted in a dormitory on 70 girls aged 11-14 years having the same socioeconomic and oral hygiene conditions. These students were randomly divided into 2 groups; the first group (N=35) using Sage mouthwash, and the second group (N=35) using placebo mouthwash without active any ingredients. At the baseline, plaque samples obtained from the buccal surfaces of teeth were sent to laboratory to achieve SM colony count. These tests were reevaluated after 21 days of using the mouthwashes. Statistical data analysis was performed using t-student tests with p<0.05 as the level of significance. RESULTS: Sage mouthwash significantly reduced the colony count (P=0.001). Average number of colonies in test group was 3900 per plaque sample at the baseline, and 300 after mouthwash application. In the control group, pre-test colony count was 4400 that was reduced to 4000; although this reduction wasn’t significant. CONCLUSION: The Sage mouthwash effectively reduced the number of Streptococcus mutans in dental plaque. CNS Neurosci Ther. 2014 Jun;20(6):485-95. Systematic review of clinical trials assessing pharmacological properties of Salvia species on memory, cognitive impairment and Alzheimer’s disease. Salvia officinalis L. and Salvia lavandulaefolia L. have a longstanding use as traditional herbal remedies that can enhance memory and improve cognitive functions. Pharmacological actions of S. officinalis and S. lavandulaefolia on healthy subjects and on patients suffering of cognitive decline have been investigated. Aim of this review was to summarize published clinical trials assessing effectiveness and safety of S. officinalis and S. lavandulaefolia in the enhancement of cognitive performance in healthy subjects and neurodegenerative illnesses. Furthermore, to purchase a more complete view on safety of S. officinalis and S. lavandulaefolia, we collected and discussed articles regarding toxicity and adverse reactions. Eight clinical studies investigating on acute effects of S. officinalis on healthy subjects were included in the review. Six studies investigated on the effects of S. officinalis and S. lavandaeluaefolia on cognitive performance in healthy subjects. The two remaining were carried out to study the effects of sage on Azheimer’s disease. Our review shows that S. officinalis and S. lavandulaefolia exert beneficial effects by enhancing cognitive performance both in healthy subjects and patients with dementia or cognitive impairment and is safe for this indication. Unfortunately, promising beneficial effects are debased by methodological issues, use of different herbal preparations (extracts, essential oil, use of raw material), lack of details on herbal products used. We believe that sage promising effects need further higher methodological standard clinical trials. J Res Med Sci. 2013 Oct;18(10):833-9. Deodorant effects of a sage extract stick: Antibacterial activity and sensory evaluation of axillary deodorancy. BACKGROUND: Deodorant products prevent the growth and activity of the degrading apocrine gland bacteria living in the armpit. Common antibacterial agents in the market like triclosan and aluminum salts, in spite of their suitable antibacterial effects, increase the risk of Alzheimer’s disease, breast and prostate cancers or induce contact dermatitis. Therefore, plant extracts possessing antibacterial effects are of interest. The aim of the present study was to verify the in vitro antimicrobial effects of different sage extracts against two major bacteria responsible for axillary odor, and to evaluate the deodorant effect of a silicon-based stick containing sage extracts in different densities in humans. 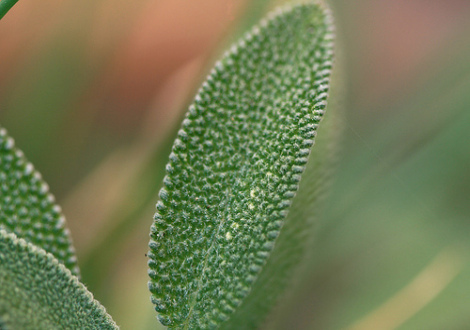 MATERIALS AND METHODS: Different fractions of methanolic extract of Salvia officinalis (sage) were evaluated on a culture of armpit skin surface of volunteers through agar microdilution antimicrobial assay. Then, randomized, double-blind placebo-controlled clinical trial with the best antibacterial fraction was conducted on 45 female healthy volunteers. Participants were treated with a single dose in four groups, each containing 15 individuals: Group 1 (200 μg/mL), 2 (400 μg/mL), 3 (600 μg/mL) of dichloromethane sage extract, and placebo (without extract). A standard sensory evaluation method for the evaluation of deodorant efficacy was used before, and two hours, four hours, and eight hours after single application of a deodorant or placebo (ASTM method E 1207-87 Standard Practice for the Sensory Evaluation of Axillary Deodorancy). RESULTS: The data were analyzed with two factors relating to densities and time. In 45 participants with a mean [± standard deviation (SD)] age of 61.5±11.8 years, statistically significant within-group differences were observed before and two, four, and eight hours after deodorant treatment for groups 1, 2, and 3. 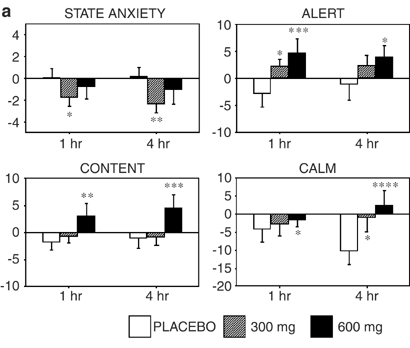 Groups 1, 2, and 3 had a significantly smaller odor score than placebo after two, four, and eight hours (P < 0.001). In a comparison of different deodorant densities, the interaction effect was not significant between deodorant 200 and 400 μg/mL, but was significant between 200 and 600 and between 400 and 600 μg/mL sage extract sticks (P < 0.001). Before running the sensory evaluation of the deodorant sticks on the subjects, a rabbit skin patch test was used to demonstrate that the formulation had no irritants. CONCLUSION: A single treatment with a stick deodorant containing dichloromethane sage extract of 200, 400, or 600 μg/mL concentrations was effective in reducing the axillary malodor level compared with the control, in healthy subjects.